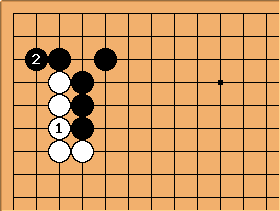 When the 3-5 Point Low Approach Press joseki comes to a halt, Black can play here. 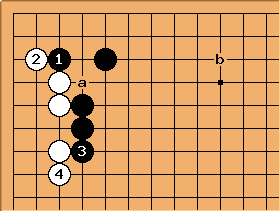 It is tempting (for the amateur) to break Black's loose connection by playing at a. However, it can be a costly mistake. 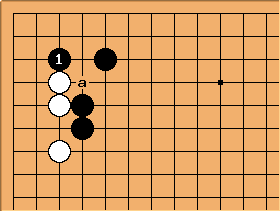 After , White has not increased his liberties and must continue with cutting off to make any sense. After , she will either lose all corner stones, or lose the marked stone in a ladder (which is assumed to work). 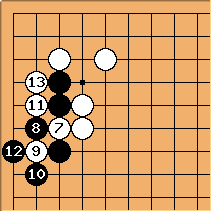 Clearly, even with the ladder aji, Black's outward thickness outweighs White's corner position, which incidentally has some bad aji as well. 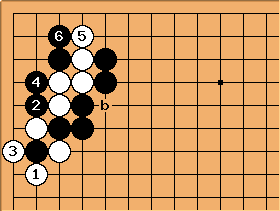 Note that White can cut at b, but that it will not lead to immediate success. 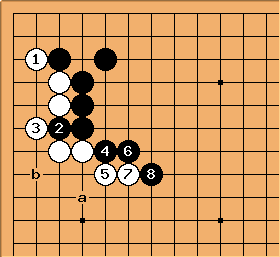 If captures the cutting stone, Black takes the corner. - shows how White remains short of liberties. 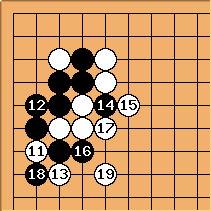 In the vast majority of pro games, White plays to foil the ladder upon which Black connects at . 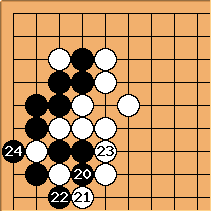 White takes up an influential position to the side, while Black takes the corner in gote. 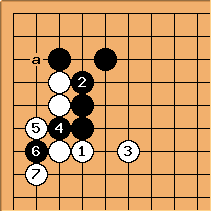 has been recommended in Ishida's joseki dictionary. is more consistent than a hane at would be, but it is perfectly possible to play there too (see below). Occasionally Black plays directly at or . 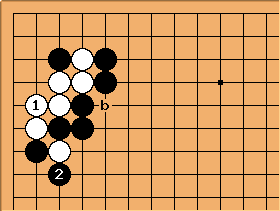 Sacrificing a stone with prevents Black from proceeding to the corner with a. 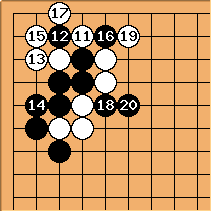 If fights for the corner, takes advantage of the cutting points which become a burden for White in the pushing battle. 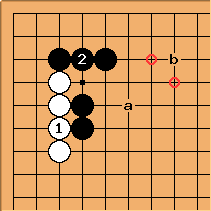 After White has to defend at a or b. This hane has a submissive feel. Black can now push again at and come back at a.
has only occurred in a pro game when White had an stone at b, negating Black's influence. 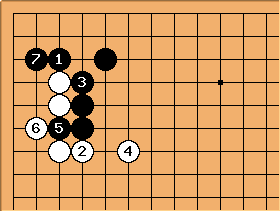 Black would then rarely press in the first place, so we can think of this as not joseki. 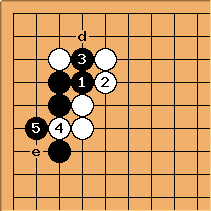 If the above mentioned ladder does not work, there is no definite joseki, but different lines have been tried by professionals. Below there are two of them, which were played repeatedly. Both Black and White can vary. White will get an outside ponnuki either way and is satisfied. The black corner after e is smaller than it may look at first sight.